Batteries have been gaining longer and longer charge lifespans, but as odd as it may sound, this didn't bring only joy. It also caused a complication: it takes longer for them to recharge when they do deplete. Or at least they would have that problem if technology companies didn't routinely look into ways of speeding up recharge time. Texas Instruments has just revealed a series of lithium-ion battery charger integrated circuits (ICs) that reduce recharging time by half in smartphones and tablets. They are called fast-charge units and bear the part numbers of bq24190, bq24192, bq24192i, bq24193, bq24195, bq24195L and bq24196. All of them are 4.5A output, 20V input-rated switch-mode chargers with I2C interface and USB on-the-go (OTG) support. Single-cell lithium battery packs are recharged fast thanks to a unique battery pack impedance compensation. Overvoltage is prevented, according to JEITA guidelines, and the efficiency is high. The 4.5A switch-mode charger achieves 92% efficiency at 2 A and up to 90% efficiency at 4 A of output current. Energy Star and European Union charging specifications are, of course, met as well, and system-level design benefits from programmable thermal regulation temperature also. That the chips are simple to design is just the icing on the cake. All of them have Power Path management, synchronous FETs, integrated current sensing, internal loop compensation and bootstrap diode. 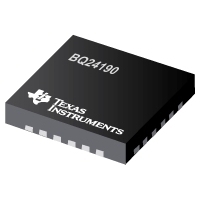 In addition to phones and tablets, the new chips from Texas Instruments will help 4G LTE routers, power banks, Wi-Fi speakers, portable medical equipment, etc. The TI bq2419x battery chargers for single-cell Li-Ion batteries should be available to product designers for $2.5 / 1.95 Euro in 1000 quantities. No details exist on deals between TI and other companies, but Texas Instruments has been known to branch out. It definitely has contacts thanks to how many power management and analog signal chain products it sold over the years, and the wireless power, audio, health technology, gesture recognition, touch feedback, and energy harvesting hardware.